Review originally ran in Shelf Awareness for Readers. Reprinted here with permission. Champion marathoner Becky Wade travels to nine countries to explore running cultures. In 2012, NCAA All-American star and Olympic hopeful Becky Wade received a Watson Fellowship to travel around the world to explore her passion: running. "Seventy-two beds, eleven pairs of running shoes, and 3,504 training miles later," Wade has since become an elite marathoner, drawing on her experience of cultures in nine countries to perfect her sport. 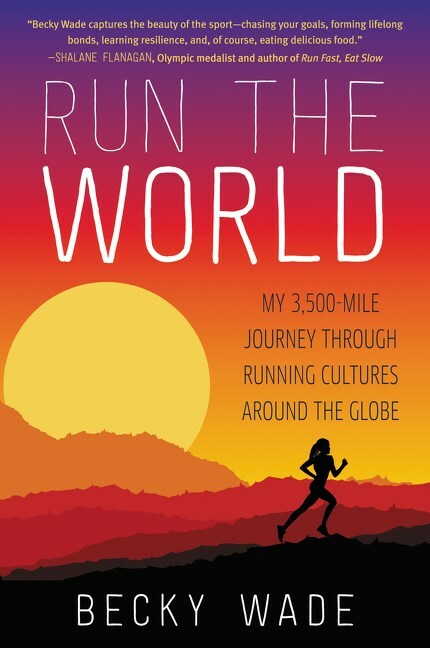 In Run the World, she tells about her travels--and the lessons she learned along the way--in precise detail. Wade went first to England, then on to Ireland, Switzerland, Ethiopia, Australia, New Zealand, Japan, Sweden and Finland. Along the way, she watched the 2012 Summer Olympics, ran with the competing clubs of Oxford and Cambridge universities, trained in the Swiss Alps, joined numerous running clubs, met coaches, dipped in saunas and ice baths, learned to run by feel, learned to run by pacing watch, tested different race strategies, experienced alternative medicine, ran training runs of all kinds (trails, cross country, speedwork, distance runs) and forged countless friendships. Peppered throughout her incredible account of these adventures are photographs of various stops, along with recipes from each country she visited. Run the World is more than just a memoir of this incredible trip: Wade provides insight into the many staggering differences--and sometimes shocking similarities--she encountered along the way.Run the World is a simple reminder of why so many love the sport of running--be it as spectator, amateur or professional athlete.